Two very gorgeous cards Shirley,love the butterflies. Thanks for sharing your beautiful Dress.I will have to get my cutting machine from my Sons. Thank you, Shirley! The gown is lovely! Love the butterfly cards. Thank you for the gown file. It will come in handy I know. Your new designs are beautiful and so is the dress. Thank you! Beautiful cards, so spring like. Thanks for the freebie. Beautiful beautiful cards Shirley, love those little butterflies they are a great fill in the card and looks so effective. Thanks for the dress, I know which challenge to use that on LOL I shall be making it NOW :). Thanks for all your lovely comments I really appreciate hearing from you. Have a good week. Very pretty card, Shirley. 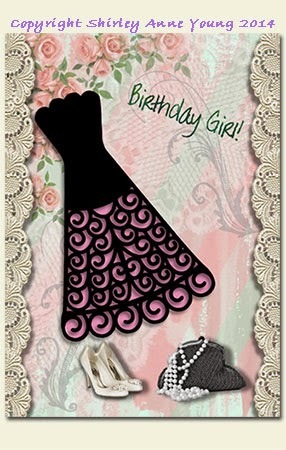 I can't wait to use the dress on a card for my card club. Love your cards. Thanks for sharing the lovely dress file. Shirley, your cards are beautiful and the dress file is wonderful. Thank you for sharing. Great cards,and thanks you for the free dress cut file. Thank you so much for the free dress cut file. It's very pretty! Your butterfly cards make me long for spring! Hi Shirley wow your card is just beautiful and the butterfly looks beautiful! Very pretty!! Both cards are lovely Shirley im particularly fond of butterflies oncards loving the dress pattern too. Thank you for the download. The filigree dress is beautiful, as are the cards. How pretty - can't wait to make a card with it! Thank you!